Marriott Hotels, the flagship brand of Marriott International Inc., announces today the opening of the company’s 4,000th hotel: Marriott Marquis Washington, DC. A remarkable milestone, this hotel–the capital’s largest–also signifies a homecoming for the Marriott family. Marriott Marquis Washington, DC opened this week, 87 years after J. Willard Marriott and Alice S. Marriott opened a nine-seat root beer stand up the street from the hotel. Marriott Marquis Washington, DC is owned by Quadrangle Development, along with its partner Capstone, and is operated by Marriott International, Inc.
A landmark hotel for both the District and Marriott Hotels, the Marriott Marquis Washington, DC features striking high design—from an all-glass rooftop to a 56-foot steel sculpture centerpiece—and cutting-edge technology, from interactive TV’s in every guest room to a just-released Marriott Hotels mobile services app. Connected to the Walter E. Washington Convention Center via an underground concourse, the Marriott Marquis Washington, DC brings more than 105,000 square feet of meeting space, 1,175 rooms including 49 suites, and five signature dining experiences to its downtown Washington, DC neighborhood. Situated at 901 Massachusetts Avenue, NW and spanning almost an entire large city block, Marriott Marquis Washington, DC is one of only five Marriott Marquis properties in the country. Marriott Marquis Washington, DC debuts technology throughout: from interactive LCD televisions in every guest room, allowing guests to stream their own content from their tablet or mobile device, to the hotel’s DAS System (Distributed Antenna System) for a clear wireless signal throughout the entire hotel, top to bottom. Recognizing that guests are dependent on their mobile devices, the hotel will offer the brand’s high-tech mobile service apps, designed with the next generation traveler in mind. These include mobile check-in and checkout; mobile guest services, which allows guests to digitally request everything from an extra towel to a wake-up call; and Red Coat Direct, a first-of-its-kind app that lets meeting planners input and adjust meeting requests with a swipe of a screen. Marriott Rewards members will have access to Marriott Marquis’ exclusive 6,500-square-foot M Club Lounge with Wi-Fi throughout and an outdoor terrace seating 81 people. Business travelers will appreciate the state-of-the-art 8,000-square-foot bi-level fitness center, complimentary for hotel guests only. Built for the athletic guest in mind, the fitness facility features the latest equipment and tech for cardio, strength and core training. 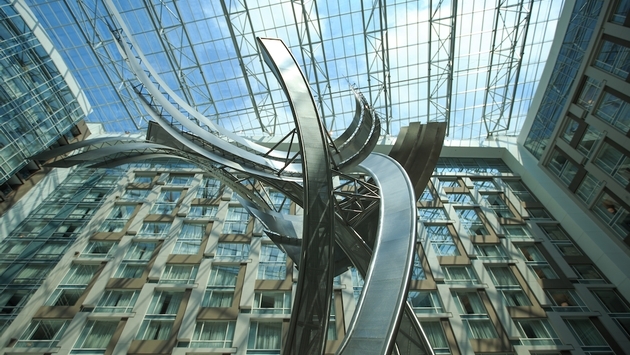 Connected via underground concourse to the Walter E. Washington Convention Center, Marriott Marquis is expected to have a highly anticipated, long-term impact on the city’s meetings business, by becoming the convention center’s anchor hotel. The hotel offers more than 105,000 square feet of meeting space including 83 meeting rooms, a 31,000-square-foot Marquis Ballroom, two 11,000-square-foot ballrooms, an 18,000-square-foot indoor event terrace, and a 5,200-square-foot outdoor event terrace. Unique to this hotel, the below-grade meeting space (Marriott Marquis is as deep—94 feet—as it is tall) has been thoughtfully designed to incorporate natural light that filters several floors down into the meeting corridors from the open spaces above. Events DC, the official convention and sports authority for the District of Columbia and the owner-operator of the Walter E. Washington Convention Center, contributed $206 million to the construction of the hotel. The fifteen-story Marriott Marquis Washington, DC creates a striking new visual in the Washington, DC landscape both inside and out. Reimagining how artwork and natural light is present in a hotel, the Marriott Marquis features bold three-dimensional sculpture pieces that are both visually dramatic and provide integral functionality to the flow of the hotel. The 44,000-square-foot glass ceiling atop the lobby atrium allows natural light to stream into all of the hotel’s interior-facing rooms as well as its active Greatroom lobby, and even filters into the below-grade meeting spaces. The Greatroom lobby provides a destination where guests and locals can gather, by themselves or with friends or colleagues, to relax, socialize and work. Featuring the largest piece of artwork in any Marriott Hotel, the Marriott Marquis’ lobby is home to an extraordinary 56-foot high, 27,000-pound sculpture, The Birth of the American Flag, by renowned Baltimore-based sculptor Rodney Carroll. Two dramatic 54- and 52-foot bronze and silver walls, America and Flag, frame the open-air grand staircase to the lobby’s terrace. Other Greatroom lobby design attributes include a cherry blossom branch woven into the running the length of the white marble lobby floor, glass enclosed fire pit, two other sculptures with water features (Threads That Bond and Stars). With free Wi-Fi and USB ports and outlets throughout the lobby, hotel guests and locals can work on their laptops and relax with their own tablets. The hotel’s custom designed guestrooms feature a soothing neutral palate, Wi-Fi, and Marriott Hotels’ signature bath amenities by THANN, a natural Thai skincare line. Interior-facing guest rooms and suites enjoy a spectacular view of the sculpture, while exterior rooms face out with views of downtown Washington, DC. The Marriott Marquis incorporates the site’s historic Samuel Gompers AFL-CIO building, which includes an upscale lounge, bi-level fitness center and suites. The hotel’s elegant glass and masonry exterior enwraps the historic building with an enormous glass atrium rooftop tying the building together. Marriott Marquis Washington, DC was designed by the renowned Cooper Carry Architects, Atlanta, and TVS Architects, Atlanta, in a joint-venture collaboration, with interior design by HOK Design. It is planned to be one of the country’s largest LEED Silver (Leadership in Energy and Environmental Design) certified hotels. “We are very excited to be celebrating the much-anticipated opening of the Marriott Marquis Washington, DC,” said Elliott L. Ferguson, president and CEO of Destination DC. “Developments such as the Marriott Marquis strengthen our tourism industry and help us to attract visitors, drive economic impact and create jobs." The hotel’s dining experiences are under the leadership of Executive Chef Matthew Morrison and will feature fresh, seasonal menus sourced from both local and Mid-Atlantic purveyors as well as the hotel’s rooftop herb garden. Marriott Marquis introduces five varied dining outlets to the downtown Washington, DC culinary renaissance: Anthem, a vibrant casual dining restaurant with a nod to the original 1927 Marriott Hot Shoppe including a nine-seat counter and a crowd-pleasing focus on breakfast; The Dignitary, an upscale lounge including a 40-seat outdoor patio and an extensive menu of bourbons and signature Moscow Mules; High Velocity, a high-tech sports bar with 48-beers on tap; a lobby bar featuring bites from Marriott Hotels’ signature “5/10/20” menu which consists of locally sourced small bites, shareable plates and lounge friendly entrees; Dining Your Way, easy, fast, and affordable 24/7 food service for delivery to guests’ rooms or pick-up; and a specialty restaurant to open in late 2014. The hotel’s inaugural catered event will be held on Saturday, May 10, a special charitable Mother’s Day Brunch for military families to be hosted by the Association of the US Army. The hotel’s formal dedication and grand opening will be held on Tuesday, June 10. For more information and reservations, please call 202-824-9200 or visit DCMarquis.com.